Today I'm sharing 2 nonfiction works. They are both heavy books with difficult subject matter. In 1934, a photograph was taken of a baseball team. These two rows of young men look like any group of American ballplayers, except perhaps for the Russian lettering on their jerseys. The players have left their homeland and the Great Depression in search of a better life in Stalinist Russia, but instead they will meet tragic and, until now, forgotten fates. Within four years, most of them will be arrested alongside untold numbers of other Americans. Some will be executed. Others will be sent to “corrective labor” camps where they will be worked to death. This book is the story of lives—the forsaken who died and those who survived. 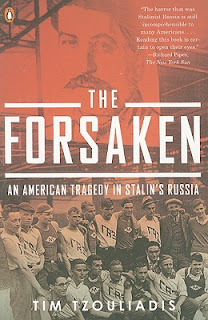 Based on groundbreaking research, The Forsaken is the story of Americans whose dreams were shattered and lives lost in Stalinist Russia. When the Allies stormed Berlin in the last days of the Third Reich, Adolf Eichmann shed his SS uniform and vanished. Following his escape from two American POW camps, his retreat into the mountains and out of Europe, and his path to an anonymous life in Buenos Aires, his pursuers are a bulldog West German prosecutor, a blind Argentinean Jew and his beautiful daughter, and a budding, ragtag spy agency called the Mossad, whose operatives have their own scores to settle (and whose rare surveillance photographs are published here for the first time). 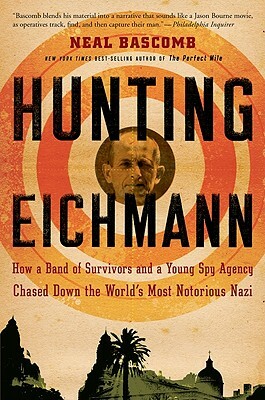 The capture of Eichmann and the efforts by Israeli agents to secret him out of Argentina to stand trial is the stunning conclusion to this thrilling historical account, told with the kind of pulse-pounding detail that rivals anything you'd find in great spy fiction. Jennifer, you are not helping my WW II book addiction. Hunting Eichman is going on my list! I too tend to like these "heavy" history books. These both look great. In terms of "The Forsaken", it is interesting how many people from the Western Democracies were lured into believing in Stalin and his regime. What a monstrously evil government he created and led. It is amazing that anyone made it through those years in the Soviet Union without being arrested! I tend to gravitate towards the more macabre elements of history too. I always said that if I were ever going to get my doctorate, I would have done something about the psychology of Hitler on the Germans. It is such a fascinating subject - to me anyway. It's fascinating to me too Michelle. The more I read on the topic the more I shake my head.